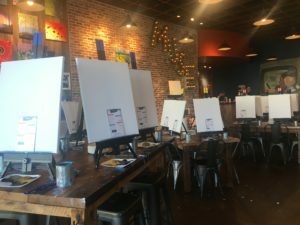 Muse Paintbar just opened its doors last year in C’ville, and it’s a great spot for you to enjoy while you are here, especially if you enjoy getting creative. And if you’re not-so-creative? Don’t worry! The instructors are pros and they’ll help you. Plus, the paintings are chosen to be beginner level. And if you’re not a beginner, you can go your own way with the painting- it’s encouraged! You’ll arrive and be greeted by the friendly instructor. You’ll take your seat and wait for the start time. But while you wait- what better time to get some wine? 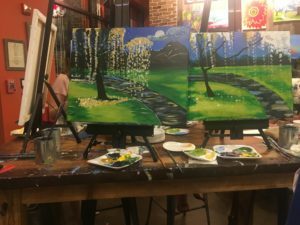 While other wine & paint spots in the area require you to bring your own drinks and snacks, Muse Paintbar is named this way for a reason. They have their own bar, and you can order wine, beer, or cocktails. You can also order a bite to eat while you paint (though eating and painting might be a dangerous combination- paint in your snacks?!). After you get your drinks and food, the class will begin. Paint palettes will already be made up for you, and your instructor will begin by talking about the brushes you’ll use, and even how to mix the paint correctly. Soon enough, you’ll begin creating. The instructor will play a fun mix of music. It’s important to note that if you enjoy a quiet painting environment, this is not the spot for you. Their classes have semi-loud, upbeat music playing. It feels a little bit like a dance party and a paint party combined. The instructor will make his or her rounds to help any struggling painters, and you’ll go step by step through a beautiful painting. At the end, you’ll of course have a masterpiece you can proudly hang in your home after your trip to C’Ville ends. We highly recommend Muse if you’d enjoy a fun, friendly, upbeat date night. Getting creative together, even if you’re not the most talented artist, is a great way to mix things up. You’ll get to know your date better (whether you’ve been together 20 years or 20 days) and you’ll have fun in the process! This entry was posted in Charlottesville, Charlottesville VA, Date Night and tagged CharlotesvilleVA, charlottesville, date night by Foxfield Inn. Bookmark the permalink.